I feel I have quite a few nice pieces of furniture (mostly thanks to craigslist) but it doesn’t seem like it is coming together…I’m thinking it might be the lack of paint and art on the walls that makes things look a bit dull. What do you think? I love the dark/bluish greys, loved the emerald greens I saw on your post and love wallpapers. My initial idea was a dark grey on the wall the tv will be mounted on and one light grey throughout the open space. But I do love the dark wall colors…but not sure how it will look as this space is not super luminous throughout the day. I wish more light would come through but this is the typical Baltimore row house and not many windows…so I do want to maximize the light that comes through. I also thought of painting the ceilings some kind of white to give contrast. Anyways – I’m open to suggestions, light or dark colors and am ok with taking some risks! So there it is…any ideas you could spare? I hope so! First of all Heloisa, you have great furniture and a beautiful space! We love all your plants and are impressed by your Craigslist prowess. Katie is crazy for the hutch in the dining room, and Mera is ready to burgle the hand planter from the table next to the chair. Your home is lovely! 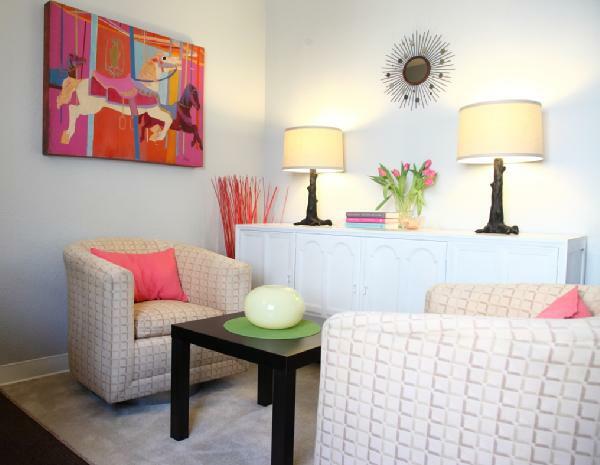 We – like you – think your space will benefit from the addition of color, art on the walls, and a few cozifications. We’re going to take this step by step and we’ve broken our answer into four categories: Paint Colors, Gallery Wall, Over the Sofa, and Textiles. Even though we’re big fans of wallpaper and saturated color, we think painting your walls a single color all the way through will highlight the openness of the space and make it look brighter. We’ve got some ideas for bringing in the jewel tones and patterns you love in other ways, but we’ll get to that in a bit! We think your instinct for light gray was right on, and we really like the idea of having white trim and a white ceiling that contrasts with the delicate gray walls. We learned from Katie’s recent foray into the sometimes harrowing world of gray paint that choosing one is no easy task, but we’ve got some suggestions for swatches to try in your space. We would definitely recommend you look for cooler grays rather than warmer ones, which can often skew tan. Katie is really happy (deliriously happy) with the Crystal Ball by Miller Paint she used in her living room. Miller Paint is an Oregon company (and as far as we can tell doesn’t retail on the east coast), but many paint retailers will be able to find a formula and do a color match for you. 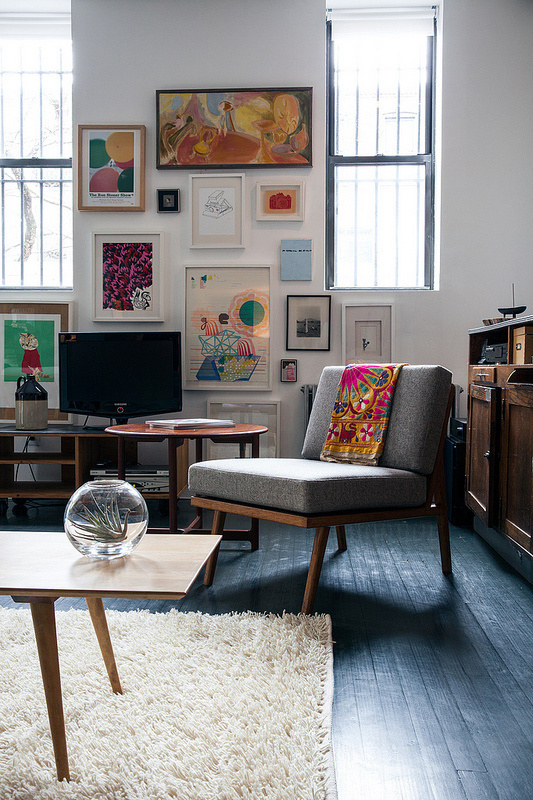 We wonder whether you’d be able to relocate the gorgeous credenza that is currently to the left of your couch over to the wall next to the window (where your art is hanging). Moving it will break up that long horizontal line and make it more natural to center something over the couch. 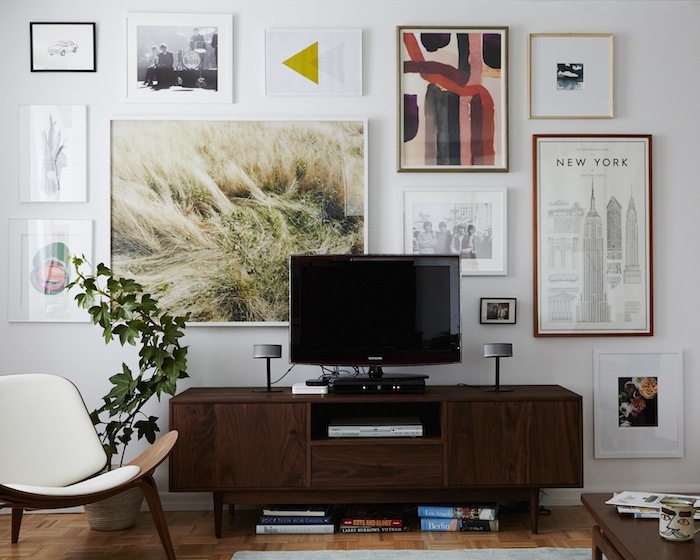 Because we suggest you hang a gallery wall behind your TV, we think you should stick a single large piece over the couch so things don’t look too busy. 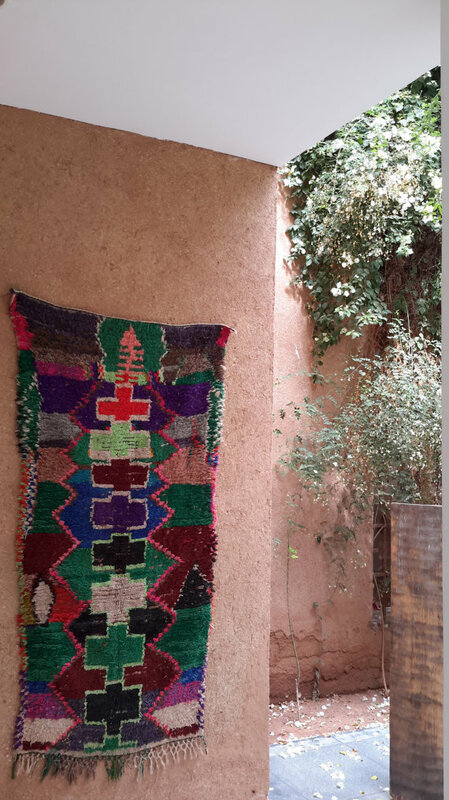 Large art can be really expensive, but a beautiful rug like this vintage Moroccan one (hung horizontally) could be a great alternative. The colors are gorgeous and this would be a great way to bring those darker tones you love – and some texture – into the room. 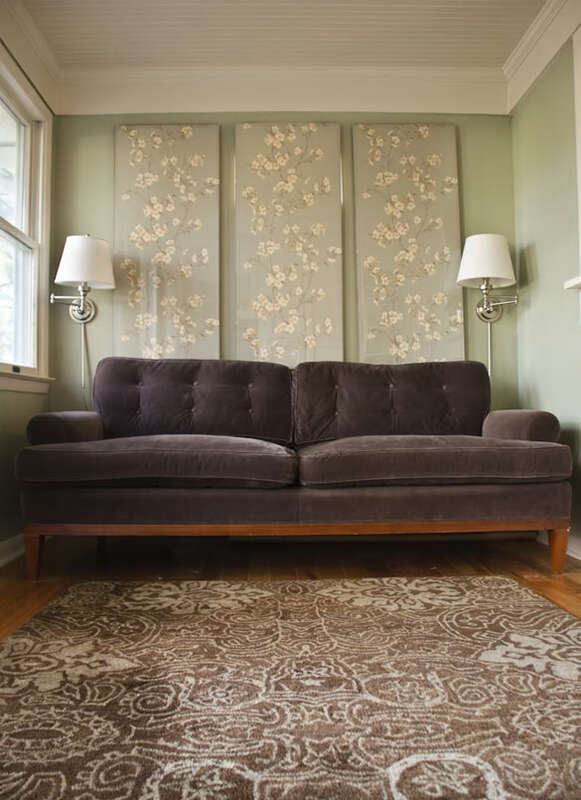 Or, if you’re still interested in bringing wallpaper into the space, you could frame a panel (or two or three) of your favorite pattern. Just make sure it’s not too busy so that it doesn’t compete with the gallery wall. Thanks so much for sending us your question Heloisa! We hope we gave you a few new ideas and if you’re willing to share pictures of your finished space down the road, we’d love to see them! We’ll be back on Friday for our final post of 2014 – yep, Red House West will be taking a break so we can spend the holidays with family and friends (and, you know, work on our houses). Thanks for reading along! I love your suggestions. 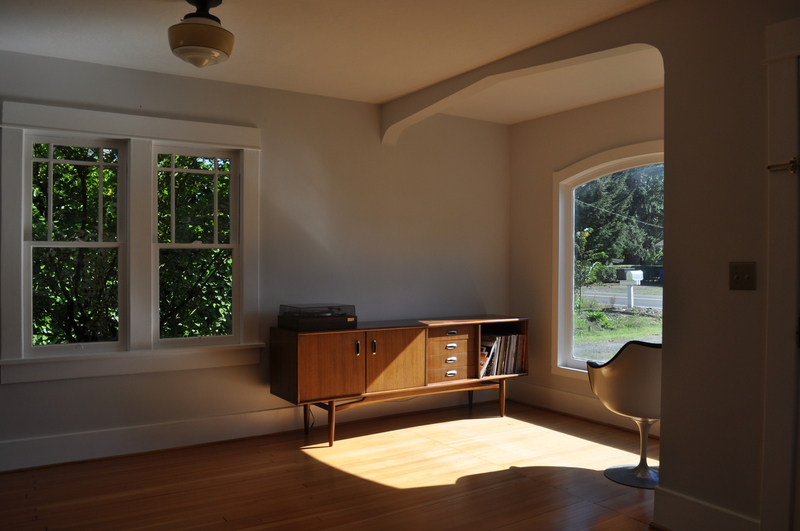 I recently painted my house Aloof Gray by SW. I found it to be a very neutral gray color with green and blue undertones. I actually lightened it by 50% and it came out this beautifully light gray color. I had it all color matched at Lowes too. Great idea to lighten a color you already liked – sounds lovely! Hey Kates – I didn’t know there was such thing as lightening the paint – thanks for the tip! Heloisa, your home is really lovely and I hope that if and when you employ some of these suggestions you will share your “after” with us! Here’s my two cents: if you move the credenza to the wall next to the window, and remove the gallery wall above it to install a gallery wall around the TV, you are left with nothing over the credenza. (Unless I missed something.) So I would follow M & K’s brilliant idea to frame some wallpaper and hang a panel there, and definitely put a light-bouncing mirror over the couch. We’re here for you Nina! 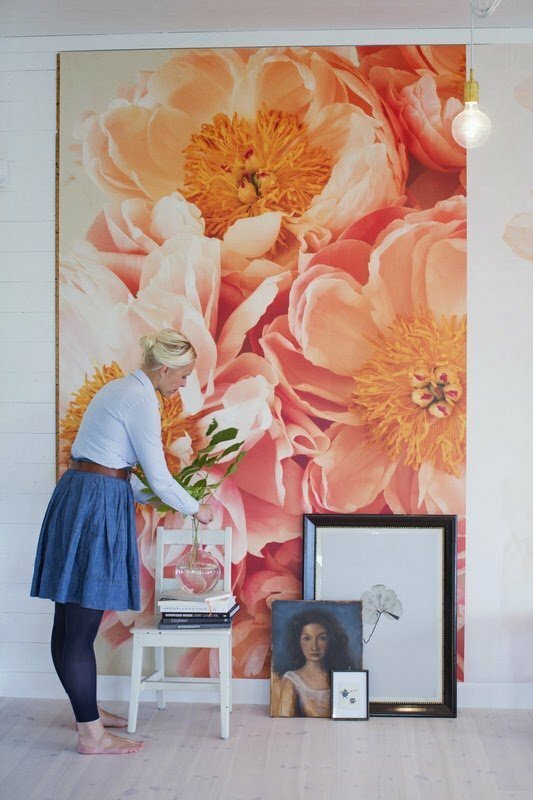 I had never thought about framing wallpaper – brilliant! I will look into it. 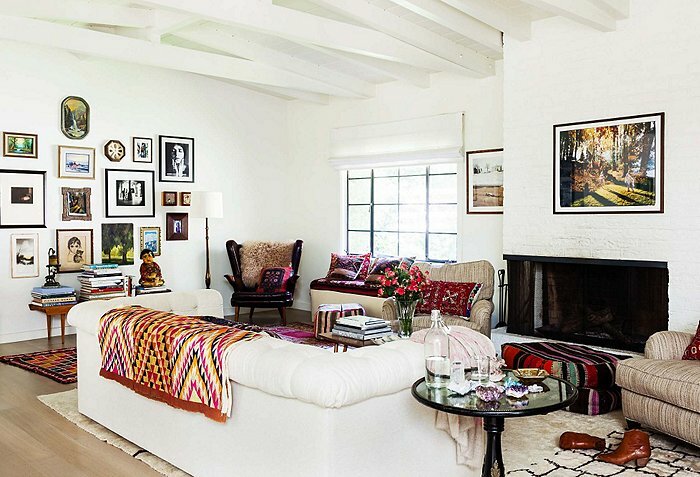 I like the idea of moving the credenza to that wall – I don’t think that next to the couch is the right place for it. The gallery wall I have now was not really thought out – I was sick of empty walls and just went for what I had on hand and never worked on it again. I have other pictures but need to put them up. But I think the living room does need something large and a framed wall paper is definitely a cheaper and fun option. Thanks for your ideas! Heloisa, your furniture is so gorgeous! Holy wow! Mera and Katie, I love your ideas and I am freaking out over those emerald textiles! I hope I’m not stepping on your toes to add more ideas? One comment as a whole is that I think your place, even more than color, could use TEXTURE. There are a million dorky Apartment Therapy articles on it that might be worth the read. Another thing I could see, to break up the long horizontal-ness of the credenza into the sectional, is swapping the places of the living room credenza and the dining room hutch. (It seems like there is something—a chair?—next to the hutch in the dining room right now, but maybe that could find another place too?) Plants could still go on the shelves of the hutch, or on the windowsill, and some of the things that are on the hutch could be arranged on top of the credenza, maybe with some more vertical elements mixed in. I am just some guy on the internet squinting at pictures, so I don’t know if it would actually work in your space, but it could be worth a shot to try! Even if you decide not to go with the gallery wall, I would highly recommend covering up those electrical plates above the TV somehow. Other wild ideas, just to throw them out there in case any of them stick for you: The ottoman—would it be possible to temporarily/removably “reupholster” the top of it so it’s less matchy? The lamp that’s currently on the credenza seems about as basic as you can get—silver (I think? ), clean lines, white drum shade—could you add texture, color, and a little bit of weirdness with a vintage lamp that’s beautiful and a little outside your comfort zone? That half-moon throw on the couch is RAD but kind of disappears the way it’s folded neatly away right now—what if it was draped over the back of the couch or even not perfectly folded? Also, the armchair that’s in there now is great but swapping it out could be a way to bring in new, saturated colors—I see solid, jewel-toned velvet there in my mind, because, well, I think velvet is the solution to 85% of decorating quandaries. Thanks for sharing your ideas PF! I’m with you on the transformational powers of velvet. PF – I’m with you in all your ideas! 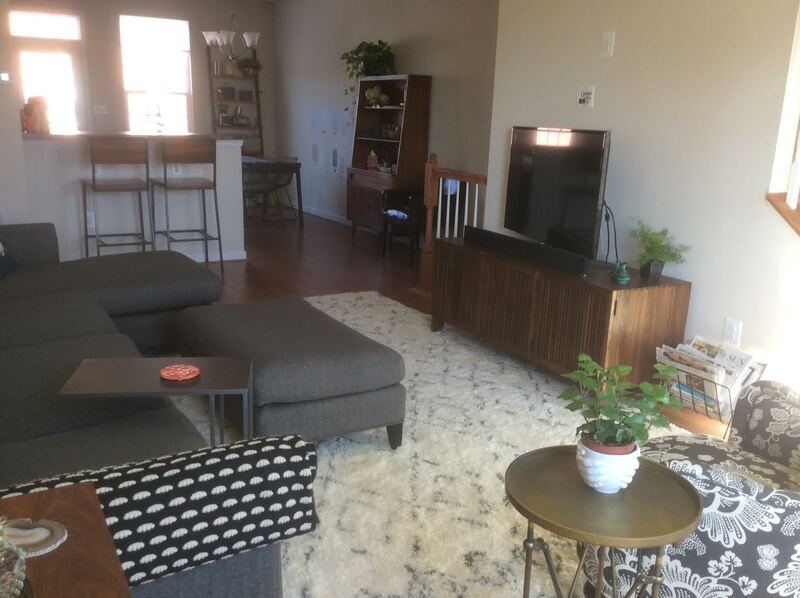 I think the furniture arrangement is too linear – I hadn’t thought about swapping the credenza for the hutch but I love it! I will absolutely try it. The electrical plates on the wall should be covered once we mount the TV – we were waiting to paint before doing so, so you can imagine how long the tv has been sitting there… I agree the chair in the living room is not working – it didn’t go well with the rug which is a shame since it is a beauty so I’ll move it to the guest room once I find another chair. I have been looking for a velvet chair – just like you said! – on Craigslist but no luck yet. And I can’t afford to buy a new one, so it’s been a waiting game. I can’t wait to put a solid color, velvet chair there. IKEA has a nice one in blue – but not sure it is too big for the space. So ill wait for my craigslist luck a bit more. 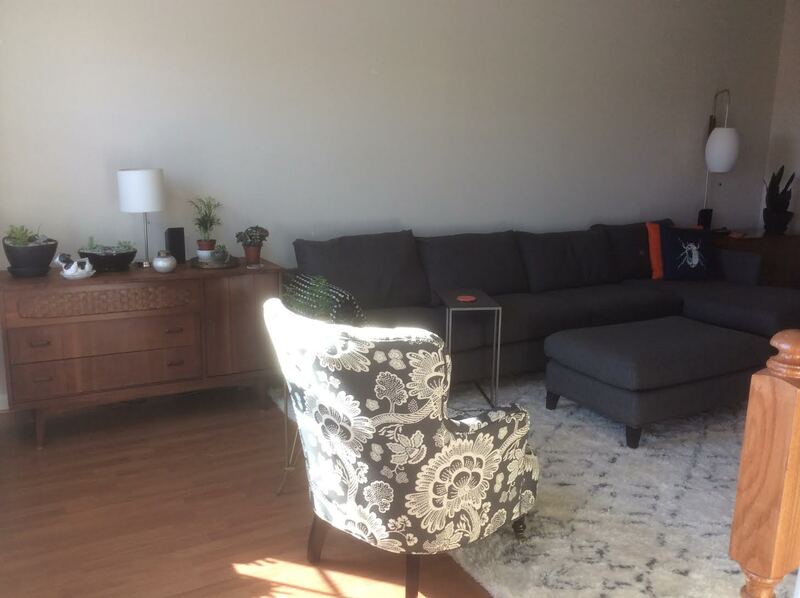 I also don’t love the ottoman since it is too matchy – but not sure what to do with it. We do use it lots and we need it at that size – for now, I like the idea of throwing something on top to change it a bit. Or will think about returning it – I’ve had problems with the ottoman since the day I bought it anyways. Long story. And yes – texture! I haven’t done much about it because I felt I need to paint first to then go on and think about more colors and textures. I will absolutely look on the Internet for ideas. And that basic lamp is also going once I find something vintage and fun on Craigslist. I wish there were some good thrift stores around here but so far I’ve had no luck – and I can’t say I haven’t tried! I know all of the goodwilll a and salvation armies around the baltimore area! Thanks much for your comments and if you think of anything else let me know! 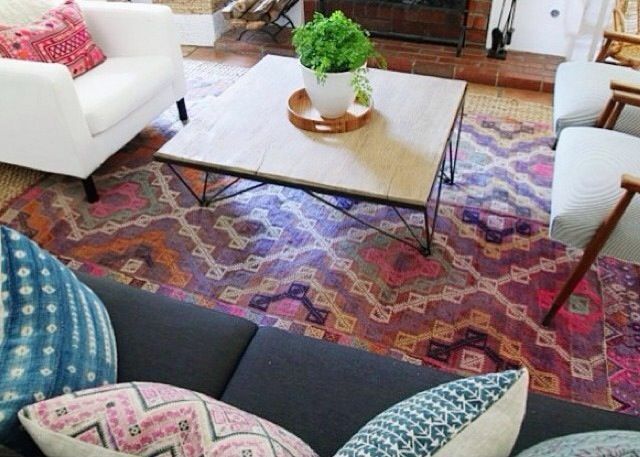 I think eventually I’ll have to change the rug – I’m also not crazy about it….any rug suggestions are also welcome! fantastic ideas for this space! love the idea of adding emerald green. my only thought is to consider ways to balance the big sofa. 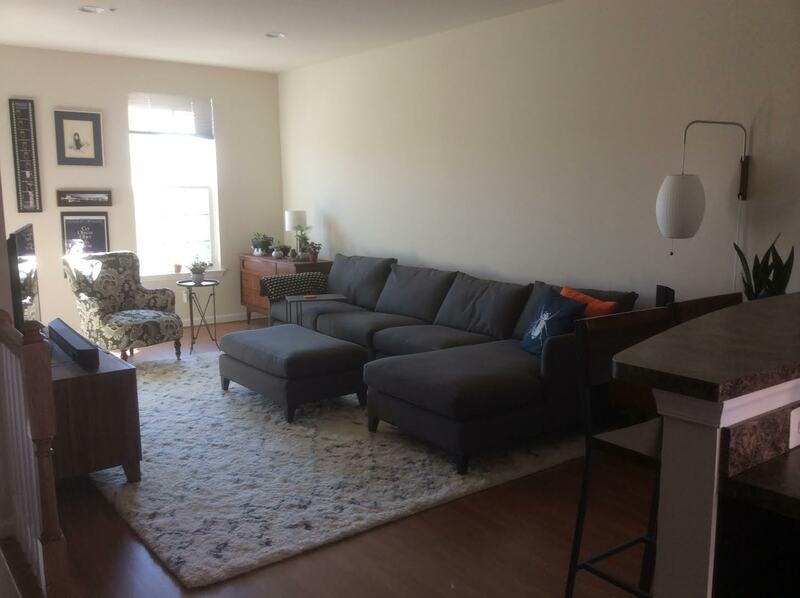 i like the hanging sconce on the right, but maybe a floor lamp or something taller to balance the sofa on the left. and the ottoman looks cozy, but bringing in a less matchy coffee table ( or recovering the ottoman) would add a new texture and richness to the room! I hope we get to any chances you make Heloisa! Mera and I thought (but forgot to write) that a tall, potted plant would be great on the left side of the sofa and would add some balance/texture too. I like your idea about the ottoman – maybe just a small rug laid over it? Emily – I agree with the idea of something to balance out the sofa – maybe a plant to a floor lamp can work. I thought about moving the credenza to the wall and leave the space beside the couch open – and then perhaps have a hanging planter using the space up high. I love hanging planters and am thinking where I can put them in the living room. I definitely need to do something about the ottoman. Thanks for your reply and I will absolutely keep you all posted of any changes! Hi Mera and Katie – thank you so much for the great ideas! I love all of them and will definitely work to put them into action and once the living room is put together I will send the “after” pictures to you all. 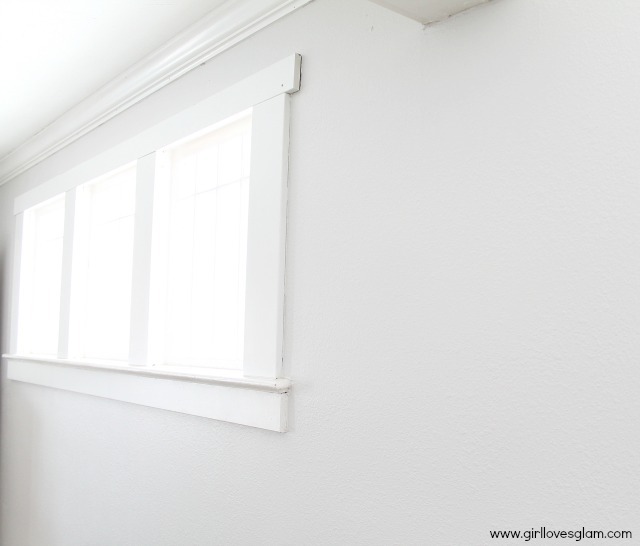 I agree with the color suggestions – before this post came out my husband and I spent a day thinking about living room colors and narrowed the choices to Benjamin Moore’s Cotton Ball or White Dove. I believe they are close to the suggestions here and we will absolutely take them into consideration now. 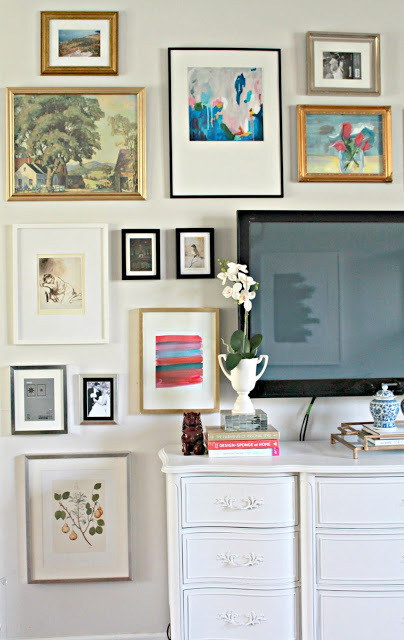 The gallery wall is an awesome idea – I definitely don’t like that the tv is the center of attention and was thinking of ways to disguise it a bit. 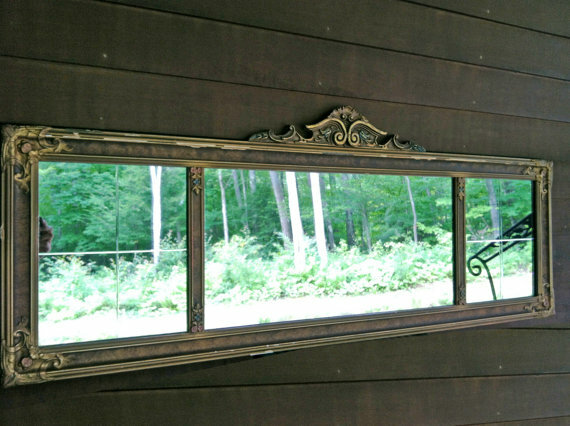 And yes, behind the couch – a mirror would work well! I love the mirror you showed here – I’ll be on the hunt for something with the same look and feel. A large plant next to the window where the credenza is now will look beautiful. I don’t like the configuration of the living room furniture as it is now – it is too linear and it doesn’t make the space right for social interactions. Now with all of these suggestions I have renewed energy to move things around! I knew I couldn’t go wrong about asking for Katie and Mera’s help but I didn’t think about all the great suggestions that would come from your readers! Thank you so, so much! Any other suggestions you have/think of send them my way 🙂 it is so helpful to have a fresh pair of eyes (or several of them) to help with my living room!